Written by Michael Tatarski. Image courtesy of James Clark. A Saigon-based blogger and rail enthusiast has released an updated map of the city's long-dreamed of metro system. 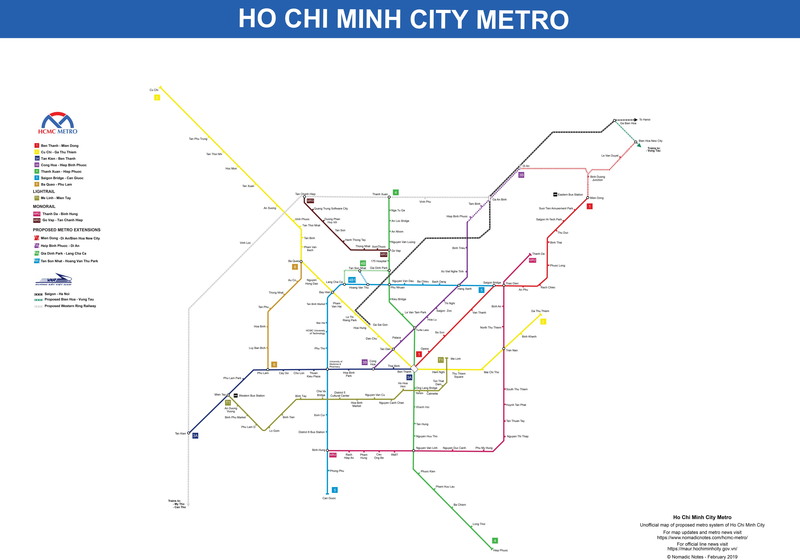 James Clark, an Australian digital nomad and creator of the site Nomadic Notes who has been based in Saigon for years, recently created a new map of all of the planned local metro lines. This follows in the wake of Clark's ambitious 2016 map of every planned or proposed railway line throughout Southeast Asia. The colorful Saigon map depicts six metro lines, one light rail line and two monorail lines, all of which have been officially announced at some point in the past. These include lines whose construction has already begun such as Line 1 and 2 and lines that have only gotten as far as a feasibility study, like Line 4. "After making the future Southeast Asia railway map I wanted to make some regional and city maps," Clark tells Saigoneer via email. "This is my first Saigon Metro map, and I was inspired to make it as there was no updated version of the future metro." Of course, anyone who pays attention to progress on this project will know that only one line - Line 1, running from District 9 to District 1 - is actually under construction, meaning Clark's dreamy map is a long way from reality. And we mean a long way. Nonetheless, that didn't deter the frequent traveler from putting the graphic together. "The lines were easy enough [to illustrate] as they are provided on the MAUR [Management Authority of Urban Railways] website," Clark shares regarding his preparation. "Most of the research came down to finding station names and where the stations might be. I ended up unearthing PDF documents buried in the eighth page of a Google result from consultants and development organizations which have metro details," he adds. The vast distance between this map and the actual situation on the ground in Saigon may be worrying to some, but Clark tries to maintain a positive attitude regarding work on the metro. "Hope for the best and expect the worst is what comes to mind when I think of the Saigon Metro. It's a bit disheartening to see how far back news reports go, especially announcements of some metro lines being operational by 2009," he says. "On the hopeful side, other cities have shown that the first line is always the hardest, so Saigon is finding out the trials and tribulations of building a brand new metro. Taipei took eight years to build their first 10.5-kilometer metro line, and they now have an amazing metro system." For now, Saigoneers can only hope that one day they'll be able to ride something similar to the metro system depicted on Clark's map.